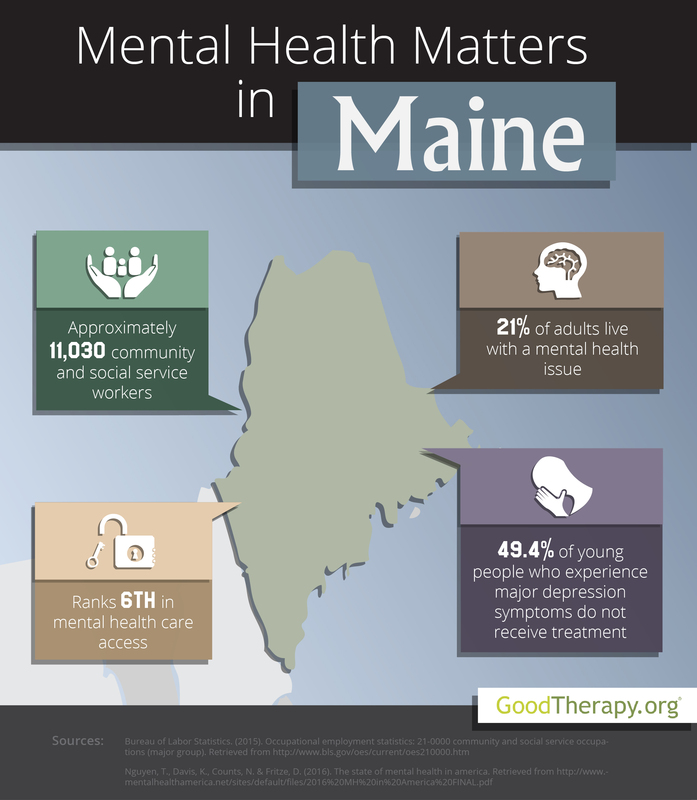 Find a therapist in Maine with GoodTherapy.org. Statistics from the United State Census Bureau assert Maine had roughly 1.3 million people living in the state 2015. Of this total number of residents, 95% were white, 1.4% were black, 1.2% were Asian, and 0.7% were American Indian or Native Alaskan. The Bureau of Labor Statistics (BLS) reports 11,030 residents had jobs in various social and community service fields. These occupations include work at depression treatment centers, addiction rehabilitation centers, hospitals, schools, clinics, community centers, religious institutions, correctional facilities, mental health facilities, and residential treatment centers in Maine. According to the BLS, residents who were employed in these fields earned an estimated wage of $43,840 in 2015. In 2016, Mental Health America (MHA) gave Maine an overall rank of 17th—when compared to all states in the U.S. and the District of Columbia—for mental health standards within the state. In adult ranking and youth ranking, Maine was 25th and 26th respectively. The state was 49th in prevalence ranking, which suggests a high prevalence of mental health issues among residents of all ages. However, an access to care ranking of 6th indicates people in need of mental health services are receiving treatment. Researchers who worked on the MHA survey claim the state’s high access to care ranking correlates with social measures such as high rates of high school graduation and low rates of violent crime in the state. The 2016 MHA study shows mental health issues affect 21.3% of adults in Maine; this percentage corresponds to roughly 225,000 people. The study also reveals almost 9% of adults are dependent on drugs or alcohol, while 4.4% of adults have seriously contemplated suicide. The state ranked 48th, 29th, and 46th in these three respective categories. Despite these findings, the data suggests affected adults may be receiving some professional care. Maine had the eighth-lowest percentage of adults who experienced mental health concerns and didn’t receive treatment, and the lowest percentage of adults with disabilities who could not obtain treatment due to cost. According to Mental Health America, 15.5% of adult residents with mental health issues do not have insurance. Similar trends have been noticed among the younger population by mental health providers and therapists in Maine. The 2016 MHA report reveals many young people in the state are affected by symptoms of depression. According to the survey, 11.2% of adolescents experienced major depression symptoms in the past year, while 10.3% are currently affected by severe depression symptoms. Maine was ranked a low 47th and 49th in these respective measures. However, the data also suggests young people with episodes of depression are receiving needed care, as the state had the sixth-lowest percentage of adolescents with major depression who did not receive mental health services, and the ninth-highest percentage of young people with severe episodes of depression who received consistent depression treatment.